We spent 7 days in Órgiva in Andalucia, with Biking Andalucia, doing a variety of rides. We arrived just as it was becoming rainy, after two months of hot dry weather. But even though the weather forecast (we use Wunderground) showed high probabilities of rain, there really wasn’t much, and the forecasts seemed to change from day to day. Most of the roads around Órgiva are fantastic. The surface quality is wonderful and the traffic varies between non-existent and not-very-much. Even better, the drivers are very courteous and sensitive to cyclists. I’ve noted where the roads are of lesser quality. We really enjoyed the riding here, much more than the riding in Mallorca. Partly this was because there were far fewer cars here – it was definitely tourist season in Mallorca, and partly because the roads are more open and feel safer. We could happily have spent a lot more time here. Órgiva – Lanjarón – Beznar – Talará – Restábal – Pinos del Valle – Guájar-Faragüit – Vélez de Benaudalla – Órgiva. The ride is about 74 km (46 miles) with 1,500 meters (4,921 feet) of climbing. This is a wonderful introductory loop to the quiet roads, reasonable gradients, and long rolling hills of this area. 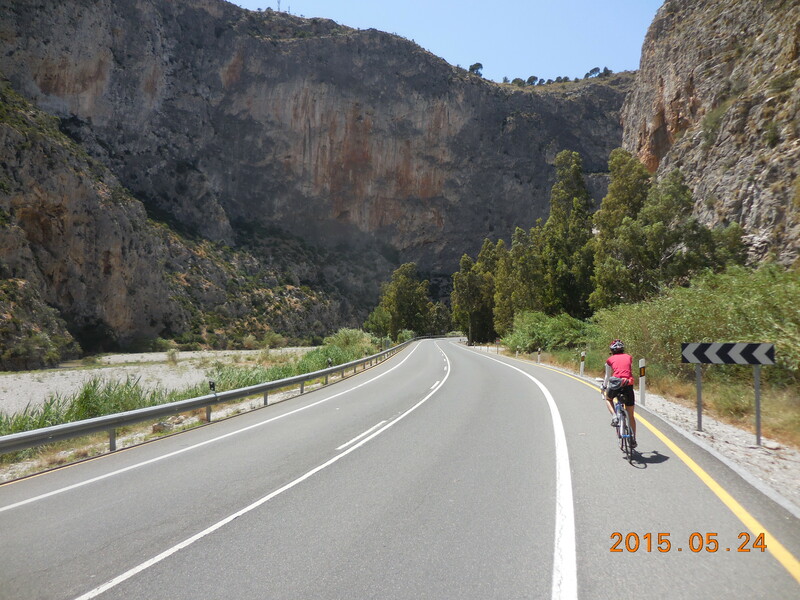 The road surfaces are fantastic, especially the recently paved 15 km between Pinos del Vallee to Guájar-Faragüit. We did the loop counter-clockwise but after doing the beautiful descent into Guájar-Faragüit and then the valley below, I would like to do it clockwise for the long climb. Starting in Órgiva, follow the A348 up and west through the pretty town of Lanjarón. Take the bypass on the left, or ride the wrong way down the main one-way street through town. Lanjarón is a popular spa town known for its pure spring water, which is bottled and sold across Spain. Continue along the A348 as it heads down and across the white bridge, then go across the roundabout and across the Autovia, following the sign for Beznar. Follow the road through Beznar and up the long straight hill to Talará, then turn sharply left and head downhill through Melegis and Restábal. 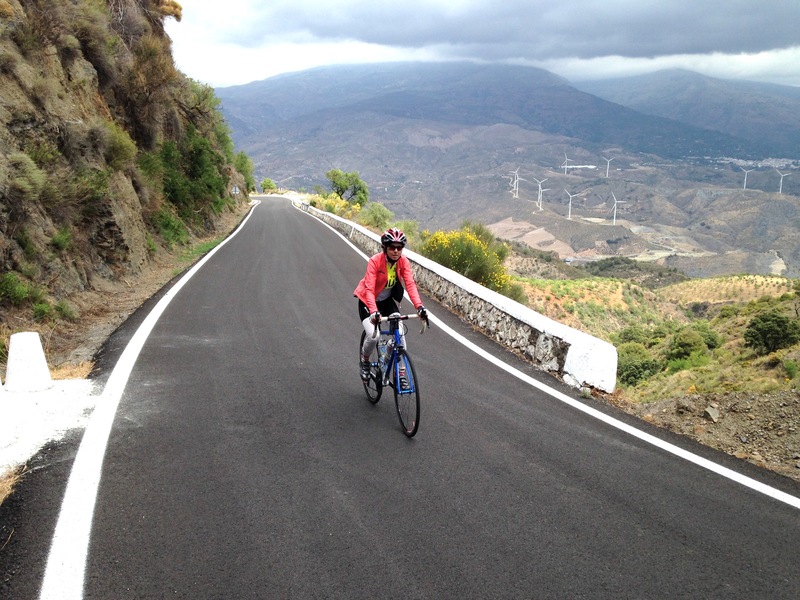 From Restábal, climb up to Pinos del Valle, then take the recently paved road for 15 km to Guájar-Faragüit, with a fantastic, long, twisty descent into the town. 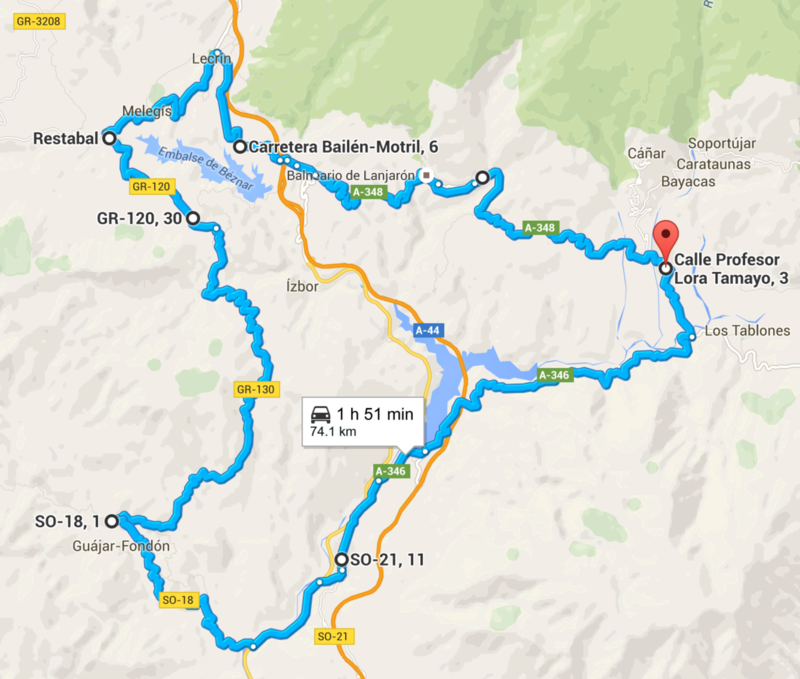 Once in Guájar-Faragüit, you can optionally add 10 km to your ride by turning right and riding to Guájar-Alto and back. Otherwise, turn very sharply left and head generally downhill to the main N323 road. Turn left at the main N323 intersection, heading toward Granada. After about 2 kilometers you can get off the N323 by turning right into Vélez de Benaudalla and following the road through town. Continue north until you get to the T-junction shortly before the big dam. (Alternatively, for a faster ride continue up the N323 to this intersection.) Turn right and follow the A346 for 12 rolling km towards Órgiva. After the short tunnel on the A346 below Órgiva, turn left onto the A348 and climb the last 3 km into town. Órgiva – Pampaneira – Pitres – Pórtugos – Busquístar – Trevélez, returning the same way. The ride is about 68 km (42.25 miles) with 1628 meters (5,340 feet) of climbing (about 320 meters are on the way down.) You can increase this to 7,535 feet by adding in the two optional climbs to Cáñar and Capileira. The two white villages you see perched on the hillside above Órgiva are Cáñar and Soportújar. This ride goes to neither. The main village the ride goes through at 14 km is Pampaneira, which is off to the right, hidden in a valley. The final town, Trevélez, is far out of sight, 34 km away. It’s a lovely long climb (with a few descents), starting in Órgiva and ending in Trevélez, passing through many small white villages on the way. These white village are a feature of the Alpujarra region of Andalucía. There are many sections of consistent 6-7 percent gradient, with a few short pitches of 8-10 percent. Starting in Órgiva, follow the A348 west over the one-lane bridge and up to the Hotel Puerta Nazarí. Just before the hotel, turn right onto the A-4132. Follow the signs for 34 km to Trevélez, passing Carataunas, and going through Pampaneira, Pitres, Pórtugos, Busquístar, before heading up the final valley to Trevélez. This last section of road is not of quite such quality as the rest of the road. Finish in the center of town at the bottom of a long descent. 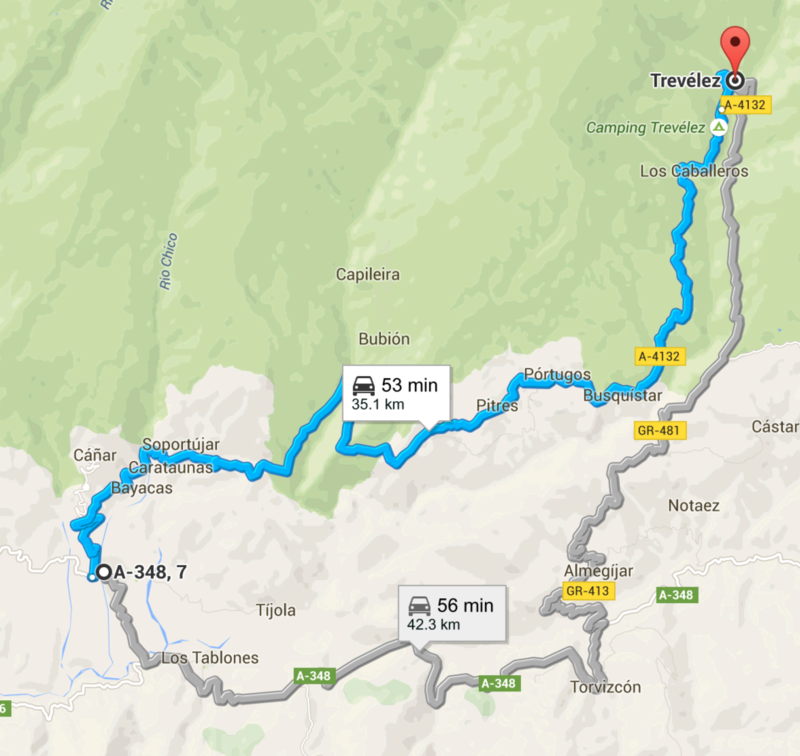 To make the ride into a loop, you can continue through Trevélez and down the other side of the valley. Where the A-4132 leaves the valley and turns east, turn right onto the GR-481 and descend through Almegíjar down to the A-348. Turn right and follow this back to Órgiva. Climb to Cáñar. Just before km marker 3, turn left and climb to the center of town in Cáñar. This adds about 10 km (6.2 miles) and 380 meters (1,245 feet) of climbing. This is also a good climb to do by itself if you want a short ride from Órgiva. 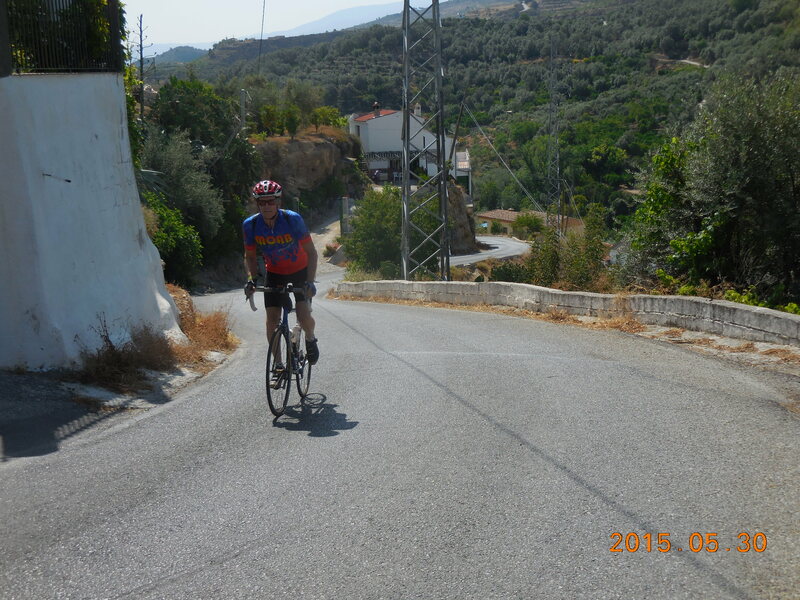 Climb to Capileira. A bit over one km after Pampaneira, just after the 15 km marker, turn left and follow the road through Bubión to Capileira. Turn around at the far end of town. This adds about 8.5 km (5.25 miles) and 290 meters (950 feet) of climbing. Órgiva – Vélez de Benaudalla – Motril – Puerto de Motril – Vélez de Benaudalla – Órgiva. The ride is about 71 km with 1,140 meters (3,740 feet) of ascent. An easier ride than some of the other rides around Órgiva, it still has some good climbing south of Vélez de Benaudalla, and riding back from Vélez to Órgiva. For much more climbing you can come back the same way from Motril, but this page describes a different way back, one that is much easier and which goes through a spectacular rocky canyon. It is still about 71 km with 1,140 meters (3,740 feet) of ascent. Starting in Órgiva, head down the A-348 to the A-346. Turn right and follow this and the SO-21 to Vélez de Benaudalla. Go through this and continue slightly left on the SO-21 and follow it as it winds uphill before making a long descent into Motril. 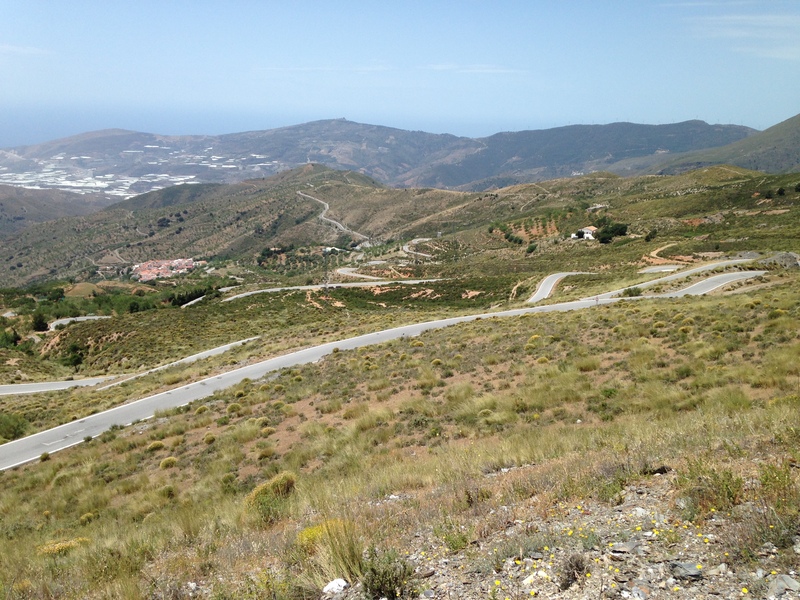 At the first big roundabout in Motril, take the road that leads downhill into town. Follow this and the obvious successors ever downward until the streets become narrower and more busy. Eventually you end up at another big roundabout with an obvious park on the other side. You think you must be near the sea, but unfortunately you are not. If you want a map, there’s a tourist information office on the other side of the roundabout. Take the N-323 north, through a big roundabout, then north again along a section of road that looks as though it might be a motorway to the next roundabout. This is where the real motorway begins but you’ll take the next exit, up the N-323. Órgiva – Haza del Lino – Cádiar – Torvizcón – Orgiva. About 80 km (50 miles) and 1,850 meters (6,070 feet) of climbing. A lovely ride with a long climb to start, then you follow a beautiful rolling ridge line, before a short descent towards Cádiar, and a long rolling return past Torvizcón back to Órgiva. Descend from Órgiva to the junction and turn left following the A-348. Climb steadily for about 4 km to just after KmM 23, and turn right onto the A-4131 to Albuñol. Follow this lovely road up to the small town of Haza del Lino. Turn left here onto the GR-5204, following the signs for Cádiar. Follow the rolling ridge for many kilometers until you reach the intersection with the A-345. Turn left and continue along the A-345 until a short, steeper descent drops you down to the intersection of the A-345 and A-348, about 2 km before Cádiar. Turn left on the A-348 and follow this as does a rolling descent past Torvizcón to the turnoff to Órgiva. Turn right and climb back up to Órgiva. Órgiva – Torvizcón – Haza del Lino – Polopos – Castell de Ferro – Rubite – Órgiva. This ride is about 93 km with 2,630 meters (8,629 feet) of climbing. A difficult ride with lots of very steep climbing. Ride down from Órgiva then turn left and follow the A-348 steadily uphill for 4 km. Continue as it rolls towards Torvizcón. At the far end of Torvizcón, turn right up the steep road to Contraviesa. The gradient is about 18% to the first turn, then it eases off. Ride across two very short sections of dirt then continue up the lovely paved road as the gradient constantly varies. There is a lot of 10-15% and up near the top there is even some flat and downhill. It’s about 10 km and 668 meters of climbing to the intersection with the road long the ridge. At the bottom, at around 50 km, turn right and follow the N340a towards Cazarones. Continue by the sea for about 5 km to Castell de Ferro. Just as you enter Castell de Ferro, turn right at the roundabout following signs to Rubite. In about 2 km turn left over the bridge, again following the signs to Rubite. At KmM 13 the real climb starts and the road surface becomes very rough. Fortunately it improves a bit as you climb but it’s never great until Rubite. The next 8 km are consistently steep with lots of 10-15% gradient. There is a steep descent into Rubite, which is between KmM 5 and 4. Take a very sharp left as you enter Rubite. At this point the road surface gets much better and the gradient eases, and the last 4.5 km to the intersection are wonderful. At the intersection turn left, climb a bit more, then do a wonderful descent back down to the A-348. Turn left and continue down to the turnoff to Órgiva. Turn right and ride back up into Órgiva. Órgiva – Lanjarón – Beznar – Talará – Restábal – Saleres – Albuñuelas – Cozvijar – Dúrcal – Talara – Beznar – Lanjarón – Órgiva. This ride is about 73 km with 1,355 meters (4,445 feet) of climbing. Follow the road through Beznar and up the long straight hill to Talará, then turn sharply left and head downhill through Melegis and Restábal. In Restábal, turn right on the GR-3300 towards Saleres and Albuñuelas. In Saleres take the steep right-hand road up towards Albuñuelas. This is brutally steep, with gradients up to 18%. This section is far and away the most difficult on the ride. As you leave Dúrcal, go under a bridge and across the roundabout following signs for the N-323a towards Nigüelas. Continue straight on the N-323a to Talará and continue through the roundabout, through Talará, and down the hill into Beznar. Follow the A-348 back through Lanjarón into Órgiva.